Innovation, Energy and Mines Minister Dave Chomiak announced a new energy strategy for Manitoba. 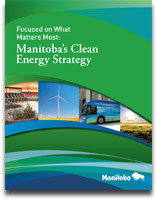 What Matters Most: Manitoba's Clean Energy Strategy was released November 20, 2012. "This strategy is all about making energy choices today that will create a stronger economy and a cleaner environment for our future. Is fossil fuel freedom achievable? We're closer than you might think," stated Chomiak. Building a new generation of hydropower projects in Manitoba's north. Improving energy efficiency within Mantoba. Expanding renewable energy alternatives such as wind, solar, geothermal, and biomass. Promoting the uses of ethanol, biodiesel, pure electric and hybrid vehicles. "We certainly do need to wean ourselves from dependence on fossil fuels. There are both good and not so good aspects to this strategy, but with public input it could have been significantly improved. It is unfortunate this strategy was released without any opportunities for public input," said Manitoba Wildlands Director Gaile Whelan Enns.